Celebrate the music of language with this band of poets and musicians. Original music, traditional poems set to music, and Celtic and folk ballads newly arranged. From capella to instrumental, from eighth century to eight o'clock this morning. Brady's Leap is a band of poets and teachers at Youngstown State University joined together to celebrate the music of language. They play original music, poems set to music, and traditional Celtic and folk ballads newly arranged. Their first CD, The Road to Killeshandra, features a wide variety of music, from comic songs to romantic ballads, from a capella to instrumental, from eighth century Irish to eight o'clock traffic. To every tune, they bring a passion for the life of sound and word. Steve Reese plays lead guitar, twelve-string guitar, banjo, fiddle, tin whistle and harmonica. As well as writing many of the Leap's songs, setting poems to music, and arranging traditional songs, Steve sings lead vocals and harmony. Kelly Bancroft is Brady's Leap's female vocalist, and also contributes haunting harmonies. William Greenway is Brady's Leap's resident wise man. He plays guitar, writes and performs original songs, and draws on a wide variety of genres from contemporary southern to Welsh and Scottish ballads, which he brings back from his regular visits to the British Isles. 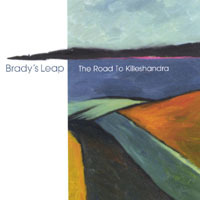 Phil Brady bangs the bodhrán and shrills a tin whistle. His repertoire consists of poems spoken aloud, songs learned living in Cork, and comic ballads from an Irish-American childhood in Queens. Jim Andrews, a physicist, plays bass. He's out of this world.